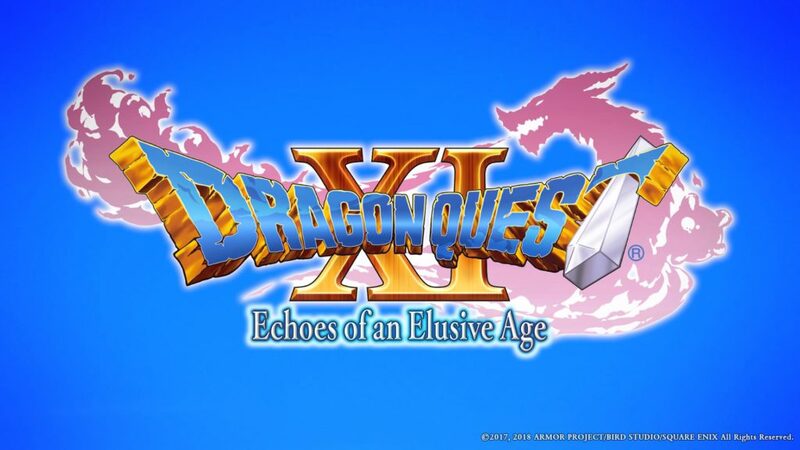 Dragon Quest, previously known as Dragon Warrior in the States up until 2005, is a series that has been running for over thirty years now. The series has recently spawned a few spin-off titles with their heroes series, but now finally the new installment has hit our stores. We were quite curious to see how the game turned out to be, as the series has come a long way from their many handheld releases, to this full-fledged PlayStation 4 title. With the game’s familiar art direction we felt at home after mere moments, ready to dig in for our review. Dragon Quest XI revolves around an unnamed protagonist who is born with a strange birthmark on his hand. This mark is the one of the Luminary, the one who is to bring light when an age of darkness is near. Sadly, the forces of evil know of your birth, and they immediately come after you, forcing your mother to flee with you at the cost of her own life. You get picked up while floating on the water in a small basket. You eventually end up in Cobblestone, a small village, in which you live a normal life until you complete your rite of passage in the village when you come of age. After doing so, your surrogate mother tells you that her father found you, and that you are really the Luminary, and you should head to Heliodor to learn more about your purpose. As expected, things don’t really go as planned, and the king sees you as an evil presence, as where there is light, there is also darkness lurking behind the corner. Luckily, you meet your first compatriot when tossed in the dungeons, and you manage to escape. From here on out your mission as the Luminary begins, all while traveling the world, but first you will have to head back home, as the king has sent punitive forces to your village, simply for raising the Luminary. The story is well developed and is very amiable, mainly because key dialogues are fully voiced, increasing the appeal of what is being told. The story progresses at a steady pace, as the gameplay is often interrupted by short dialogues and/or cutscenes, showing you what is going on. You’ll spend a decent amount of hours before finally knowing what is really going on. 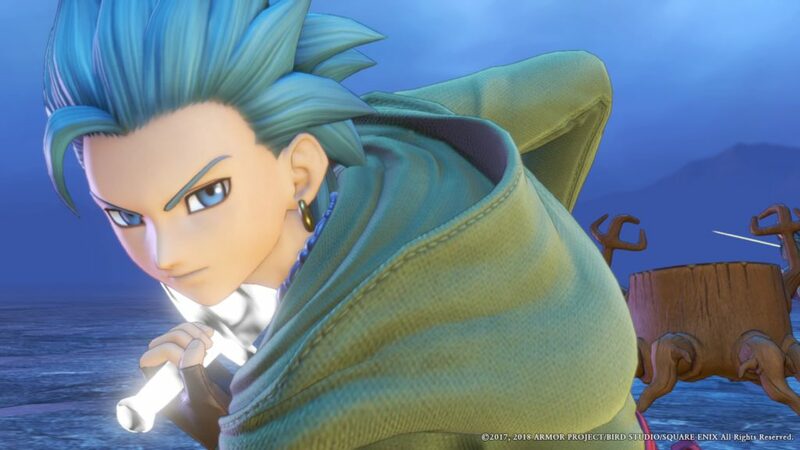 The eleventh installment of Dragon Quest looks extremely spiffy. It’s clear that Akira Toriyama has pushed the series to where it is today, thanks to his iconic drawing style, which is of course known because of the Dragon Ball series. We were treated to a picturesque world, with many different, yet familiar, characters and enough rubble and clutter to keep things interesting. The animations are fluent, the many creatures are interesting, and the world waits to be explored, even though many of the paths are fairly linear. It’s sometimes rewarding to go off the track that is laid out before you, not only for the item rewards, but also to see a bit more of the scenery. Overall this title is certainly a next generation title, even in its own comical style. As expected of a series with a grandeur such as this one, the soundtrack isn’t shy of amazing. You’ll be treated to a somewhat theatrical underscore, which works well with the adventure at hand. While the music certainly deserves great points, it’s also the voice acting that drives this title, because every conversation, safe for a few text bubbles you’ll get from NPCS, is completely voiced. The voices are sometimes a bit childish because of overacting, but they certainly do the trick and make the whole world that much more alive. 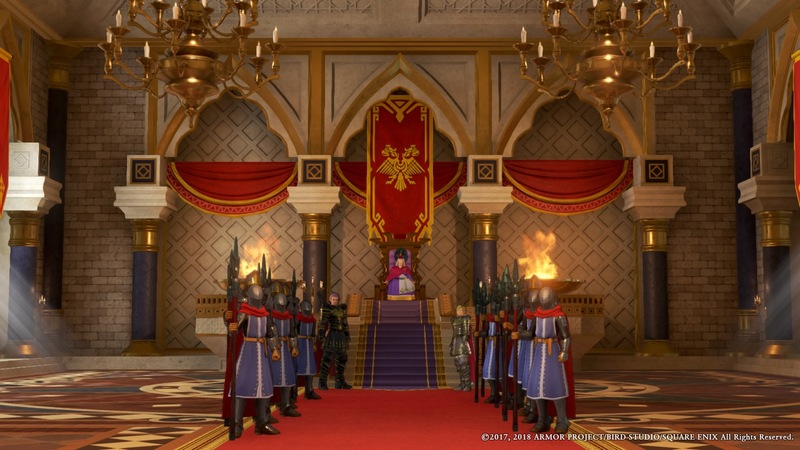 Dragon Quest XI: Echoes of an Elusive Age is a fairly traditional J-RPG, in which the story and the turn based combat are the focal points. From start to finish, you’ll have to prove yourself as the luminary who will save the world. 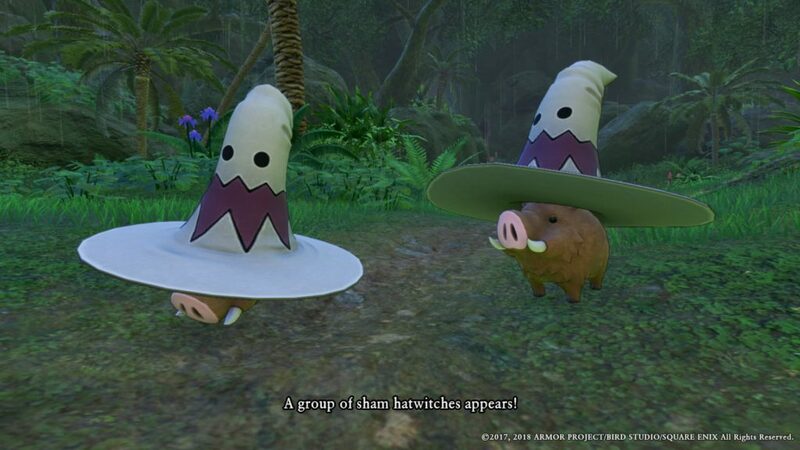 In doing so, you’ll roam around the land, battling monsters, getting to know new teammates, talking to various NPCs, gearing up and many other things that are somewhat traditional in RPG games. Even though the game is fairly linear, it does allow for some free exploring and backtracking, allowing you to grind whenever you feel too weak, or simply because you want to have an advantage over your many opponents. Many of your enemies will waddle around the many dungeons or fields you’ll traverse, granting you the option to pass them by, or surprise them, gaining a small advantage in combat. The combat itself is a traditional format of turn based battles, which is certainly nice for those looking for an old school J-RPG experience. Overall things stay easy in terms of combat, and you’ll get the hang of the system after a short session or two. Keep in mind that skipping battles may cause you to be too weak to handle certain opponents, so going out of your way to avoid all possible battles might not turn out so good for you after all. Skill in the game can be unlocked with a skill tree, but the game forces you to make hard choices, as you can’t unlock everything per character. In most cases the choices involve which weapon type you wish to use on which character, making you think about your gear. Overall the skill tree is straightforward, but you’ll have to put some thought in how you wish to skill up your characters. The game’s difficulty is very manageable, but it’s still wise to stock up on healing items and realize when it’s time to head back, heal, save and continue your journey. As the game has a very limited autosave function, wiping your party might mean you have to redo a chunk of content if you were grinding for a long time without saving. While some may be annoyed by the lack of autosaves, it’s pretty much a case of proper planning if you want to survive in the wild. 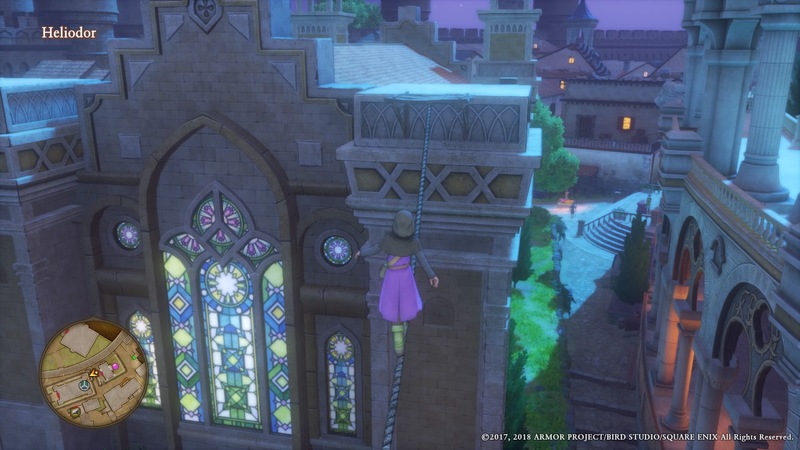 Dragon Quest XI: Echoes of an Elusive Age is a very fun retro-inspired modern J-RPG. 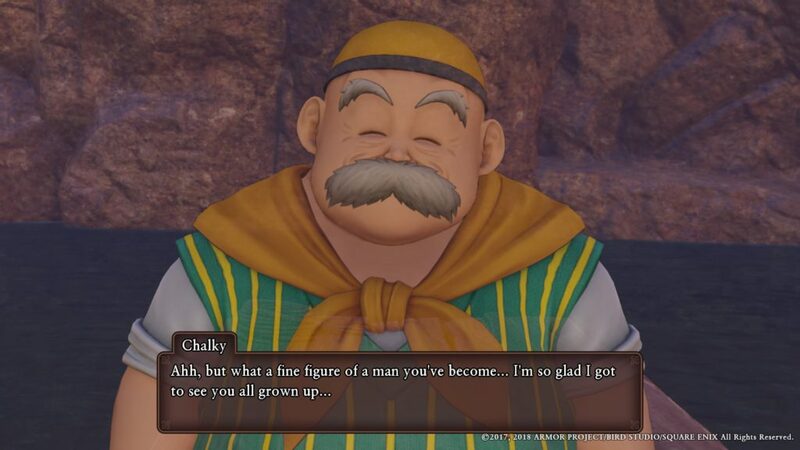 While everything in the game feels brand new and perfect for this generation, the game still clings to older values such as the traditional turn-based combat which makes the battles a lot of fun for older gamers. Even after thirty years, it’s clear that this series is still a relevant one, and one that is worth looking into. If you love a lot of story content, a bit of grinding and an overall beautiful game to look at, then we can only advise this title.